Dorsal view of Hemicheyletia wellsi, copyright Qing-Hai Fan. The Cheyletini is a group of predatory mites found free-living or in association with animal nests. The group is characterised by plesiomorphic characters for the family Cheyletidae, and is potentially paraphyletic with regard to other subgroups of the family. The southern Asian genus Hylopecheyla is parasitic, found in association with squirrels and tree shrews (Bochkov & Fain 2001). See also: The tiny lurking fear. Characters (from Bochkov & Fain 2001): Female with gnathosoma well developed, about 30%, or more, length of idiosoma, without protrusions. Gnathosomal apex with short median protuberances. Palpai tarsi with two dorsal comb-like setae and two ventral well-developed sickle-like setae. Palpai slender, claws slightly curved medially, with or without teeth. All setae of palpal tibia hair-like or lanceolate. Palpal femur and palpal genu not fused, without protrusions, bearing altogether five setae. Idiosoma ovoid or rhombus-like. Eyes present or absent. Shoulder-like projections of idiosoma absent. All idiosomal setae not exceeding half of idiosomal length. Neotrichial setae present or absent. Length of all legs not exceeding idiosomal length. Legs IV normally developed. Tarsi slender, with knobs not covering pretarsus or without knobs. Guard seta of tarsus I hair-like, variable in length, solenidion ω1 situated in basal half of tarsus I. Tibia I with solenidion. Tibia II with or without solenidion. Genu I with rod-like solenidion. Seta vI of tarsus I situated almost at same level as solenidion ω1 and guard seta. Pretarsus and claws present on all legs. Apical setae of tarsus I normally long. Tarsal setae p' and p" II-IV hair-like. Coxae III with two setae. Trochanters I-IV with one seta. Distance between coxae II and III less than half of idiosomal width. Male with palpal tarsus with two comb-like and two sickle-like setae. [A-T96] Abo-Taka, S. M. 1996. Mites inhabiting poultry farms in Egypt. In: Mitchell, R., D. J. Horn, G. R. Needham & W. C. Welbourn (eds) Acarology IX vol. 1. Proceedings pp. 97–99. Ohio Biological Survey: Columbus (Ohio). [B49] Baker, E. W. 1949. 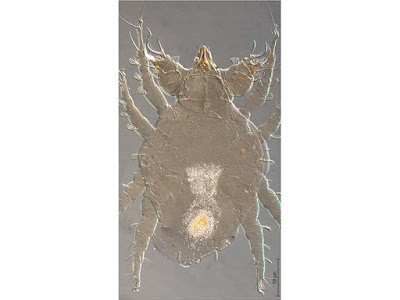 A review of the mites of the family Cheyletidae in the United States National Museum. Proceedings of the United States National Museum 99 (3238): 267–320. [BF01] Bochkov, A. V., & A. Fain. 2001. Phylogeny and system of the Cheyletidae (Acari: Prostigmata) with special reference to their host-parasite associations. Bulletin de l’Institut Royal des Sciences Naturelles de Belgique Entomologie 71: 5–36. [C-RSV-S88] Corpuz-Raros, L. A., G. C. Sabio & M. Velasco-Soriano. 1988. Mites associated with stored products, poultry houses and house dust in the Philippines. Philippine Entomologist 7 (3): 311–321. [DPD16] Dabert, M., H. Proctor & J. Dabert. 2016. Higher-level molecular phylogeny of the water mites (Acariformes: Prostigmata: Parasitengonina: Hydrachnidiae). Molecular Phylogenetics and Evolution 101: 75–90. [E62] Ehara, S. 1962. Mites of greenhouse plants in Hokkaido, with a new species of Cheyletidae. Annotationes Zoologicae Japonenses 35 (2): 106–111. [E-KO07] El-Kammah, K. M., & L. M. I. Oyoun. 2007. Taxonomic records of mite species associated with animal and poultry farms in the Nile delta, vally and N. Sinai Egypt. In: Morales-Malacara, J. B., V. M. Behan-Pelletier, E. Ueckermann, T. M. Pérez, E. G. Estrada-Venegas & M. Badii (eds) Acarology XI: Proceedings of the International Congress pp. 223–232. Instituto de Biología and Faculdad de Ciencias, Universidad Nacional Autónoma de México, Sociedad Latinoamericana de Acarología: México. [E-VVM-M07] Estrada-Venegas, E. G., I. M. Vázquez & J. A. Moreno-Moreno. 2007. Prostigmatid mites (Acarida: Prostigmata) in decaying wood from “La Mancha” Veracruz, Mexico. In: Morales-Malacara, J. B., V. M. Behan-Pelletier, E. Ueckermann, T. M. Pérez, E. G. Estrada-Venegas & M. Badii (eds) Acarology XI: Proceedings of the International Congress pp. 691–695. Instituto de Biología and Faculdad de Ciencias, Universidad Nacional Autónoma de México, Sociedad Latinoamericana de Acarología: México. [H98] Halliday, R. B. 1998. Mites of Australia: A checklist and bibliography. CSIRO Publishing: Collingwood. [TE79] Thewke, S. E., & W. R. Enns. 1979. Three new species of Hemicheyletia Volgin (Acarina: Cheyletidae) with a key to known world species. 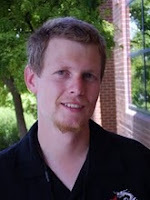 Journal of the Kansas Entomological Society 52 (1): 218–225. [WB02] Walter, D. E., J. J. Beard, K. L. Walker & K. Sparks. 2002. Of mites and bees: a review of mite-bee associations in Australia and a revision of Raymentia Womersley (Acari: Mesostigmata: Laelapidae), with the description of two new species of mites from Lasioglossum (Parasphecodes) spp. (Hymenoptera: Halictidae). Australian Journal of Entomology 41: 128–148. Last updated: 9 February 2019.